Home > News > JUST TRYAN IT, May 19. JUST TRYAN IT, May 19. 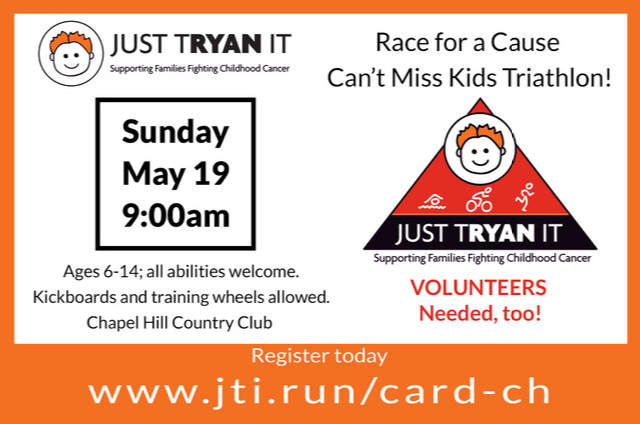 JUST TRYAN IT – Can’t miss kids triathlon for a great cause! JUST TRYAN IT financially supports families fighting childhood cancer at Duke Children’s and UNC Children’s Hospital. Sunday, May 19th at Chapel Hill Country Club, for all abilities, ages 6-14. Register TODAY! In 2018, over 300 racers participated and helped raised over $100,000. Volunteers are needed too. Watch this short video or visit the website for more information. Teams are encouraged to race and fund raise together – Spots are filling up fast so don’t delay.